Our hydroPAVERS® are also ideally suited for roofing stormwater management, with different configurations to suit the building design and requirements. 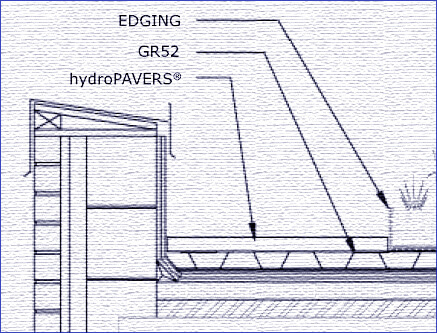 Examples of possible combinations of hydroPAVERS® and complementary products. 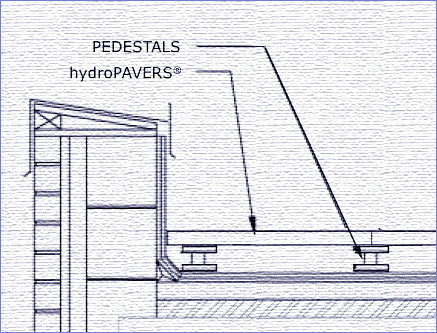 hydroPAVERS® on pedestals to create a pervious puddle free, slip resistant patio / roof deck area. 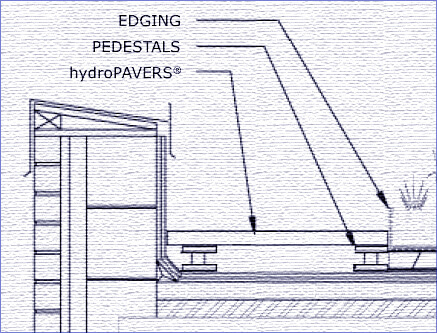 The hydroPAVERS® holds a 1/4" rain event, and water drains through after saturation. This combined system captures 6 Litres of water per square meter, or 0.148 US Gallons per square foot. Another Excellent Storm Water Solution on Roofs. 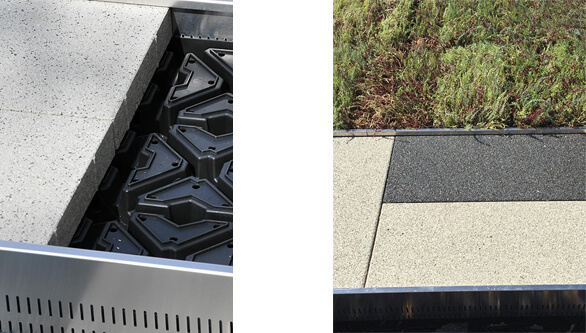 hydroPAVERS® on GR52 to create a pervious puddle free, slip resistant patio / roof deck area. The hydroPAVERS® holds a 1/4" rain event, and water drains through after saturation. This combined system captures 20.35 Litres of water per square meter, or 0.491 US Gallons per square foot. Pedestals optional depending on design and roof surface. Rendering below of a complete plan using hydroPAVERS® to meet Storm Water Requirements and certainly to provide a beautiful puddle free area. This project will use GR52, which bring the water retention to 0.491 US Gallons per square foot ! 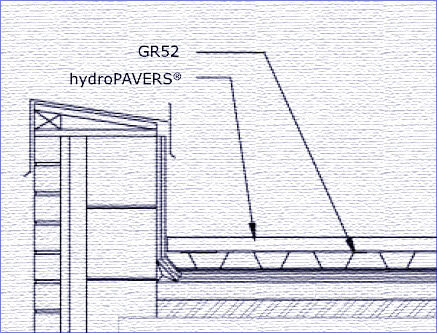 Incorporate the combination of hydroPAVERS® an GR52 - parapet to parapet to complete the green roof. The walkways now would be pervious. 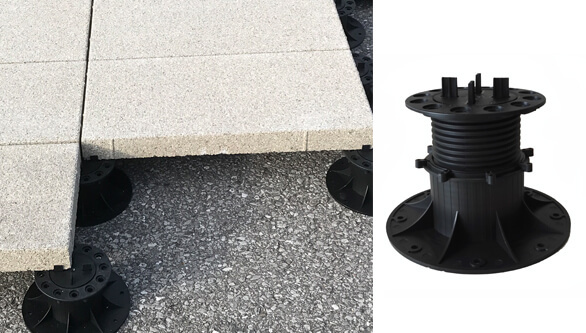 The hydroPAVERS® holds a 1/4" rain event, and water drains through after saturation. Combined, the system captures 20.35 Litres per square meter, or 0.491 US Gallons per square foot. Excellent Storm Water Solution on Roofs. hydroPAVERS® on pedestals to create a pervious puddle free, slip resistant walkways area. The hydroPAVERS® holds a 1/4" rain event, and water drains through after saturation. This combined system captures 6 Litres of water per square meter, or 0.148 US Gallons per square foot.